The chicken sounded off every morning at five am. I cannot overemphasize the predictability of this chicken, which was actually a hen, but laid so few eggs that its gender was more or less irrelevant. Furthermore, “chicken,” more so than “hen,” encompassed the absurdity of this godforsaken pet. The chicken ran around in the spinach patch by day and slept by night. It pecked at millet and wheat grains drying on mats in the sun. It hopped into the house and waddled into the kitchen and stole from plates of popcorn on the floor. It unplanted cucumber seeds from beneath tender soil. In exchange for housing, it laid one or two eggs a month, offering every few weeks what should have been a daily reparation. So, almost as if to compensate for its worthlessness in other areas of life, the chicken unfailingly sounded its alarm every morning at five am with a vigor and volume that, by any reasonable measure, should not have been achievable by the vocal mechanism of so small an animal. Without fully waking up, I could hear Aamaa get up just a moment before, or just a moment after (I was never sure which) the chicken. The sense of her rising floated up from the bottom floor into my dreams, mingled with the intuition of Mahendra’s light going on next door. Just outside the slatted window, behind the terraced garden level with our roof, Mahendra’s mother sat up like Aamaa did on the cot downstairs, and wrapped her sari around her petticoat, and coaxed the whisper of heat sleeping under last night’s coals into a small flame. In the kitchen Aamaa heated a vat of water over the fire for the buffalo. She stirred in a gritty flour mixture made from grains that the humans couldn’t eat—corn kernels with little holes in them, wheat pellets that had gone black, pale millet that was unripe. Nothing went unused. With the water heating, Aamaa would say, perfunctorily, “Eh, Bishnu.” I never got out of bed until Bishnu did. But in that half-consciousness I could hear sounds that were miles away, worlds away, circling sounds. One-two, one-two: the squirt of buffalo milk hitting the bottom of a tin pail as she is milked. Swish-scratch, swish-scratch: the leathery rhythm of a rag smoothing clay over the floor of the house. Clunk, trot and swish of goats being moved outside. I would bury my face against daybreak and sink away. The chicken signaled the dreamy hour between the start of activity and the waking of the universe. Bodies moved and clothes came down from hanging wires and water jugs migrated to baskets and piles of hay rustled and animals chewed. Tea kettles hissed over drowsy flames, smaller than the energetic fires that would cook breakfast after the sun was out. Everything was muted and soft like the blushing sky—even the baying of the buffalo was a kind of resigned honk. The chicken alone ruled that hour in a screaming traffic-cone orange. In the summer the little beast roused us at five am. In October and November, as the harvest approached, it deferred until five thirty, then six. In January, sometimes the chicken couldn’t hold out for sunrise at seven o’clock, and popped its cork just a bit early in a joyous explosion of control over the humans that ran its world. If I rolled over too many times, the chicken acquired reinforcements. “WHA-HOOOOO MAHENDRA!” Mahendra’s mother called out into the open mountainside. And I would think, Where in God’s name has Mahendra gone off to at this hour, when I have net yet brushed my teeth? And yet every morning Mahendra was missing, and every morning his mother called for him with a shriek to be envied by mothers everywhere. Okay, I would think, I am getting up, Mahendra’s Mother. Later, I am going to have a talk with Mahendra. When I rose in the morning I pulled a hooded fleece sweatshirt over my head. It was pale pink with a pocket across the front, and I wore it all day, every day. At night I kept it in a ball and hugged it and all the chalk and dust and paint and fire smoke that collected in its synthetic fibers. I kept all kinds of things in the front pocket, depending on the situation: a piece of chalk, a scrap of paper with a phone number, a photograph, a twig, candy, a guava, my folded hands, a necklace, a rupee, a pen, a plane ticket and passport. A potato. Toothpaste. Toothpaste in my pocket while I brush my teeth. I stand on the flat stone marking the entrance to our yard and initiate the day slowly, slowly pouring water from a jug or bottle onto the toothbrush, conserving every drop. Beneath the broad hush of daybreak, the brush makes a ragged sound, and the sun, her lavender lids still drawn, hides behind the Kalika Hill, waking at my pace, the pace at which I brush my teeth, slowly. Until I finish this act it is just us, looking at one another across a curve of mountainside, and all the other people are shadows, part of a world stirred but not yet waken. I keep the toothpaste in my pocket so that both hands are free to pour the water onto the brush, carefully, like a prayer before the new day. 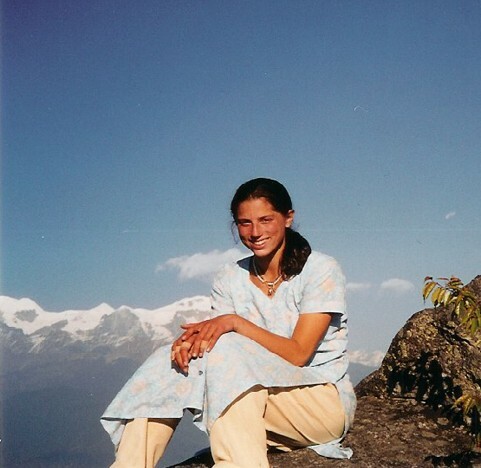 Shortly after my twenty-second birthday, decided I was going to go to a mountainous country in Asia. It could more or less have been anywhere, except that the tallest mountain in the world is on the border between Tibet and Nepal. As the home of fabulous Mt. Everest, the Nepal is more famous. So I decided to go to Nepal. It has now been quite some time since then and I have never been anywhere near Mt. Everest. However, I’ve seen it from afar a few times, and meditated upon the clouds that obscure its heavenly peak a few times more. Some perfunctory research led me to a Nepali organization run by a fellow named Asim. Asim had joined the trend of small Nepali businesses that sop up a constant flow of tourists eager to combine service work with adventure in the spiritually seductive, geographically spectacular birthplace of the Buddha. So it was thanks to Asim’s organization that a cheerful, petite woman of Filipino descent met me at the airport when I landed in Kathmandu. Her name was Emma. We were taken to the market to be measured for local clothing. This highlighted the fact that we were drastically out of proportion with everything else around. While seated on a very low stool at the tailor’s shop, I picked out two sets of cloth for two kurta salwaars—one a translucent, flowery blue that went with beige trousers, the other a pattern of small purple flowers and a deep, grounding purple for the pants. As these clothes were being stitched I wandered about the market laboring over a gift for my host family. This gift choosing business was difficult. How about a…tape player! No, too extravagant. Samosas? Er—plain, pathetic actually. (Besides, who carries samosas on an eight hour bus ride from Kathmandu to Pokhara?) What about a stuffed animal? Unique, yes, but also weird. Digestive crackers? Absolutely not. Well, perhaps I will eat those. This is too much and that is too little; this too familiar, that too unusual. Finally I bought some apples and a thick, imported Fruit and Nut Cadbury chocolate bar. These seemed safe—after all, who doesn’t want to eat an imported chocolate bar—but I figured these items wouldn’t be readily accessible in the village. It was like The Jungle or The Apollo Space Capsule—a very vague idea with very specific, completely arbitrary details attached to it. The village would be a place where apples and chocolate were considered a sensitive, thoughtful gift. A hopeful gift. In the evening I wrapped them in the purple kurta salwaar and placed them carefully in my bag. I had been in Nepal for one week. I ripped a corner out of my blue notebook and handed it to Asim, who scribbled on it and put me on a bus to Pokhara with a note in my pocket. The note said, Bhim Subedi. 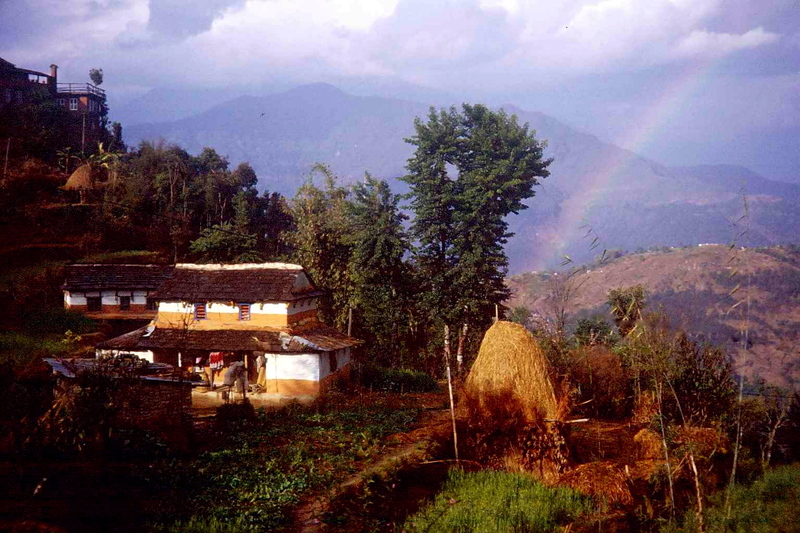 I have lived in the village of Kaskikot for many years now, but not all at one time. After my first visit during the harvest in 2002, I returned for a nine-month stay in August 2003. One week after I arrived that summer, a six-year-old Maoist insurgency broke the latest ceasefire and resumed its armed struggle against the government and monarchy of Nepal. Kaskikot, a stone’s throw from the urban center of Pokhara, saw little visible effect from the war. There were regular transportation strikes that kept us from taking the bus to the city, and nationwide strikes that added ever more school closings to the already generous holiday schedule. For the most part, however, there was water to carry and wheat to pound; the buffalo had to be milked morning and night; someone had to cook the rice. And there were local politics. That year, I remained in contact with people I met through Asim’s organization, but I was on my own. I got to know the Peace Corps volunteers living within a few hours of Kaskikot, and corresponded with the U.S. Consul himself. I visited him in his office where there was a burly security guard who stayed in the room while I asked if there was anything I should worry about with the political situation, but in the end I just left with his email address. This network of foreigners was useful in my work as a volunteer—for example, I made my Peace Corps friends promise to alert me if they got evacuated, and to stall, stall until I grabbed the back bumper of their jeep or one of those skis below their getaway helicopter. We played the occasional Frisbee game and they swore they’d ring me up on the stone-age satellite phone five minutes from my house in case of a total emergency. And petite, kind Emma was always on a list of phone numbers that my mother kept plastered to the refrigerator like the Declaration of Independence. But all that was an orbit: far away, remotely orienting, fundamentally irrelevant. The crack through the side of the blue plastic crate used for the buffalo water leaked every day. The burns on my fingers from paint and kerosene, the bend in a small footpath that reveals a stone wall in the woods ahead; the exacting smell of hospital disinfectant, and the sticks in the fire, and the rope on my forehead and the unused sewing machine, and Aamaa’s arm thrown over my waist in bed, and the note in my pocket that said Bhim Subedi; these things counted. Looking back, even the simplest details seem lit by a sharp beam, the way I used to deflect sunlight with a mirror, burning pinholes through scraps of paper in the driveway. The man of our house was struck by lightening in the same rice field where his daughter had been born. Aamaa was only twenty two years old when she became a widow one arbitrary afternoon, and the next morning, she still had an infant daughter in each arm and a hell of a lot of planting to do. You can forget it if you’re wondering about the idea of Aamaa marrying again. Until her girls were old enough to become daughters-in-law to someone else, there would be no men in this household. It was instantly clear that Aamaa and Bishnu and Didi were of little importance and no use to the relatives. Baba’s family left Aamaa to survive in this tiny house, which at that time was only the one room, just big enough for a cot and a cooking fire. And of course a young mother and her baby girls had no status in the village, even though the blood of a village is the women who clang tin jugs at the water tap and rinse their own cups after stopping by for a sip of tea. For years Aamaa gave Didi and Bishnu a handful of rice each day—she used to tell me that while holding out one cupped hand, and I ate nothing but popped corn and roti and millet paste, she would say. And this kitchen wasn’t even here. This kitchen wasn’t built until Bishnu and Didi got older, but I forget how old—maybe Didi was ten? Seven? Eleven? Bishnu nursed well into childhood. When she was five years old, she used to come home from Matrebhumi Primary and stand in the yard to drink breast milk on her feet. 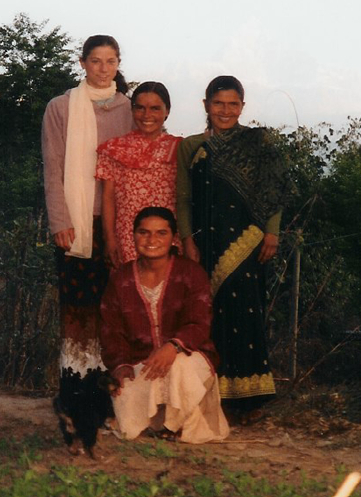 The three of them slept in one bed in their single-room home until Bishnu and Didi finished high school. It was a very small house. The attic was cleared out and I lodged my bag next to an unsteady bookcase filled with spineless collections of paper. All of Bishnu and Didi’s high school education, and every workshop or training course they had ever attended, was represented there. One light bulb, attached to a post in the middle of the room, provided a glow that at night was simultaneously inadequate and too harsh. There was a clothes-hanging wire stretching from one wall to the other and when I lay down on the mats under it with my nose looking up at the tip of a shawl or kurta, the clothing was perfectly positioned so that it blocked any light the bulb might have provided for reading. The attic had a little window that was low to the floor and open to the outside except for the wooden bars that crossed it horizontally. So when I rolled onto my side, lying on the mats, I could look out and see a sliver of the ridge, or if I sat up I could look down into the yard. Even after I stopped sleeping upstairs, the attic somehow remained partially mine. I know what you’re thinking about that. But what I mean is I never completely left the attic, even after everything that happened and only my clothes lived there, because it was solitary and still. I was aware of my altitude up there, propped up at the top of the ladder that leaned through the opening in the floor, hovering over the visiting of neighbors, the cutting of vegetables, the honking buffalo, of the chicken hopping around the yard and smoke drifting up from the fire in the kitchen, where the rice was cooking. The rice pot was everything. It was the heart-muscle of the house. And in my personal opinion Bishnu was the best cook—but the house and the rice pot were Aamaa’s. I entered both in an instant: on Monday I wasn’t there, and on Tuesday afternoon at four o’clock, I lived in the house, on the cots, over the clothes-wires, and in the rice pot. The house couldn’t have been more than twenty feet wide and the rice pot was no more than six inches across and three inches deep. I don’t know why Aamaa and Didi and Bishnu let me move in to their house and their rice pot like that, as if I belonged there. But you couldn’t move in just a little. Everything was too small and too close together. Moving into the rice pot was at once swift and complex. It was swift because moving into a rice pot is not something that can be done slowly. The spoon is in or out; your dinner is cooked in this pot or it isn’t. It’s the system, the cooking and sitting, the timing of things, serving and supplementing, the actual act of eating that is adjustable. Aamaa did not speak a single syllable of English. 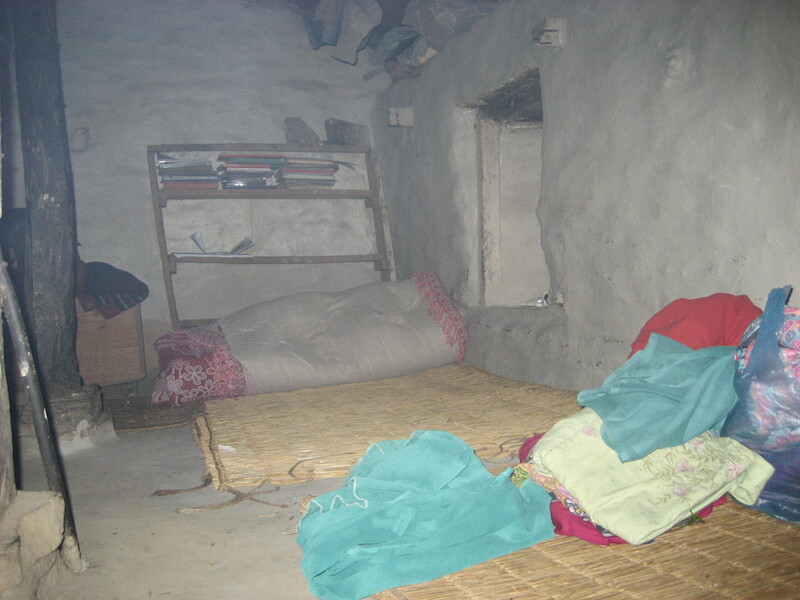 She had moved into Baba’s house—this house—at the age of thirteen, had never attended school, and could not read or write. 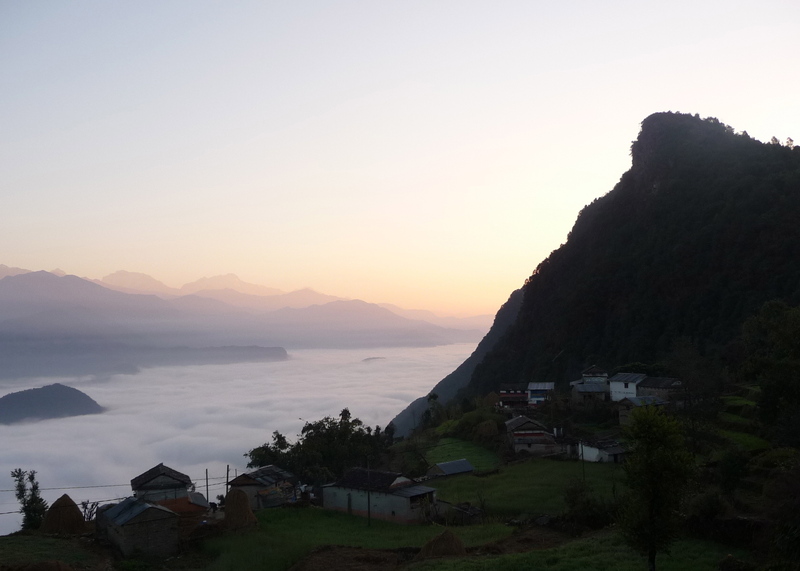 And when I first arrived and ducked into the kitchen, where she was overseeing a kettle of tea that was brewing on the fire, I didn’t speak a word of Nepali besides my own name. All I had was the blue notebook and the very, very best of intentions. With Didi and Bishnu, who had studied some English in school, this was a workable situation. But Aamaa and I were from completely different planets. I grew up eating Toaster Streudel before carpool. Aamaa and I didn’t even have the same set of vocabulary to translate. This fact didn’t seem to bother anyone. I arrived just as the sun was slanting onto the porch, and Didi led me into the kitchen, where I promptly forked over all the crackers stowed in my luggage. I also turned in the bag of hard candy I’d purchased in Kathmandu, because it didn’t seem right to keep things to myself. Well, to be quite precise, I admit that I did keep the dried fruit and only the dried fruit for digestive purposes. And it took a few days before I got up the courage to hand over my jar of Maranthra’s Natural Peanut butter; I was afraid nobody would know what to do with it, and I figured I stood out enough already. This house is alive. It is like a person. Walking inside the house was more like walking into a living body and seeing its organs beating and pulsing than like walking into a house. Every square inch of it is used purposefully. A shirt and a scythe are tossed next to each other on a bed, for example, not because there isn’t enough space to put them elsewhere, but because the bed isn’t an isolated space for sleeping, it’s also a table and a couch and a repository for old, half-dried up pens. Didi and I set my large duffel on the bed and went into the kitchen, where Bishnu was crouched on a flat wooden pirka, watching Aamaa tend to the teapot on the fire. In the kitchen, even Didi couldn’t stand up to her full five feet or stretch both arms out at the same time. I am five feet and eight inches tall. Bishnu reached behind her for four teacups, set them by Aamaa, slid a pirka towards me, and I sat down with my knees under my chin. You have had a remarkable insight into another world.